Final Fantasy 15 is about to get a heaping helping of even more DLC on March 6, when FF15: Royal Edition comes to PS4 and Xbox One. This new version of the game includes a new dungeon (Insomnia City Ruins: Expanded Map), new bosses to fight, new gear to equip, a first-person mode, and a controllable boat. Did you hear that last part? Controllable. Boat. Watch the trailer and see what you think. Despite the use of "edition" in the name and the fact that it will be sold physically with new box art (for $49.99 in the US, other regions' pricing to be determined), you don't have to scrap your existing copy if you want the new goodies. If you already own a base copy of FF15, you can simply purchase the extra content as DLC (final price also to be determined). If you've been aching to play Final Fantasy 15 on PC, March 6 is also the FF15: Windows Edition release date. Along with everything included in the Royal Edition, the PC version will support native 4K (maximum 8K) resolution, HDR10, Dolby Atmos, and mods. 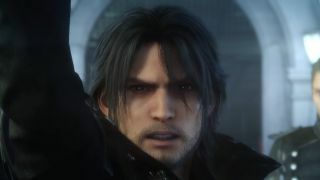 Final Fantasy 15 took roughly an eternity and a half to finally be released (okay, 10 years, but that's still a really long time for a game's development) so maybe it shouldn't be terribly surprising that Square Enix seems content to add on more stuff to an already-existing game than to start work on the next numbered installment. And personally speaking, that's fine by me. The more I get to explore the world and get to know Noctis and The Boys, the better.